So, here is a short version of recent events. We won an award last weekend. 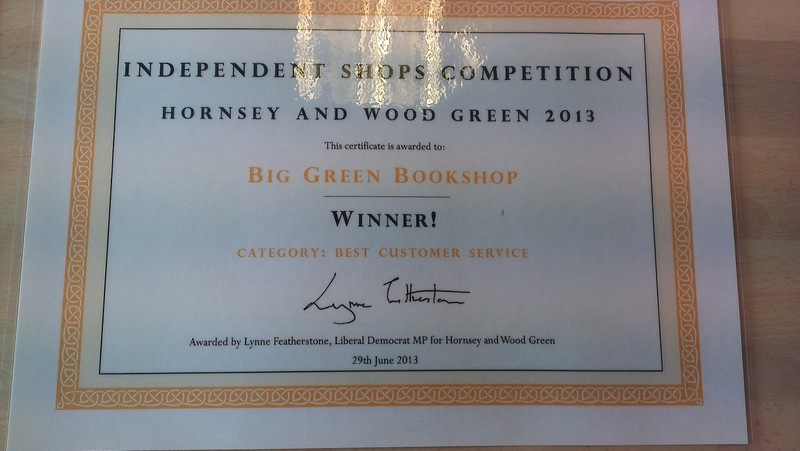 It was for having the Best Customer Service of any independent shop in Wood Green and Hornsey. That's lovely isn't it. Tim did his back in about six weeks ago. Quite seriously. He wasn't able to stand up for about 10 days. 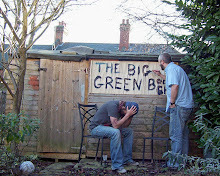 It's been pretty desperate without him at the shop, especially as we've just opened a new one. 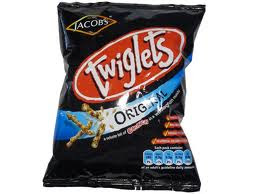 Thankfully, he's now able to get to the shop in Wood Green and as long as he doesn't do anything that involves walking, lifting or breakdancing, he's OK. I have seen him (I think) twice in the last two months. Two of my teeth have fallen out in the last 3 weeks. 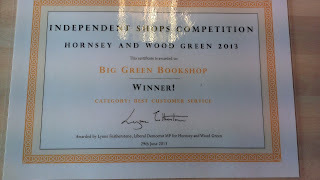 Our E-Books for Independent bookshops campaign is still happening. Richard French at Coles bookshop is in the final stages of negotiations with ReadCloud, so hopefully there'll be an announcement very soon. "I'm stuck in a Greek hospital, a quick summary. With a couple of days hols left I had my first ever epileptic fit (and concussion when I then fell off bed!). 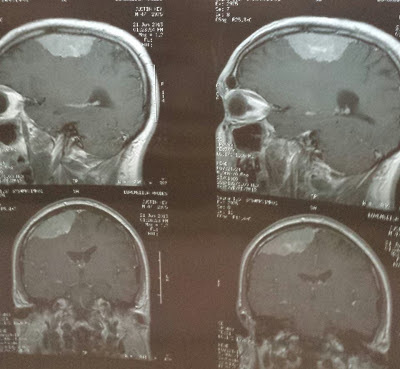 MRI scan revealed large (but most likely benign) tumour on my brain so I was put on anti-epileptic meds until doctors happy for me to fly home for operation to remove the meningioma (posh word for the tumor). Docs now say fine to fly so long as on meds but insurance company wants to check all medical records and reports and probably fly out a doctor from UK to accompany me home direct to hospital, which is delaying everything. I feel absolutely fine and have done since getting over the concussion but bored and want to get home". 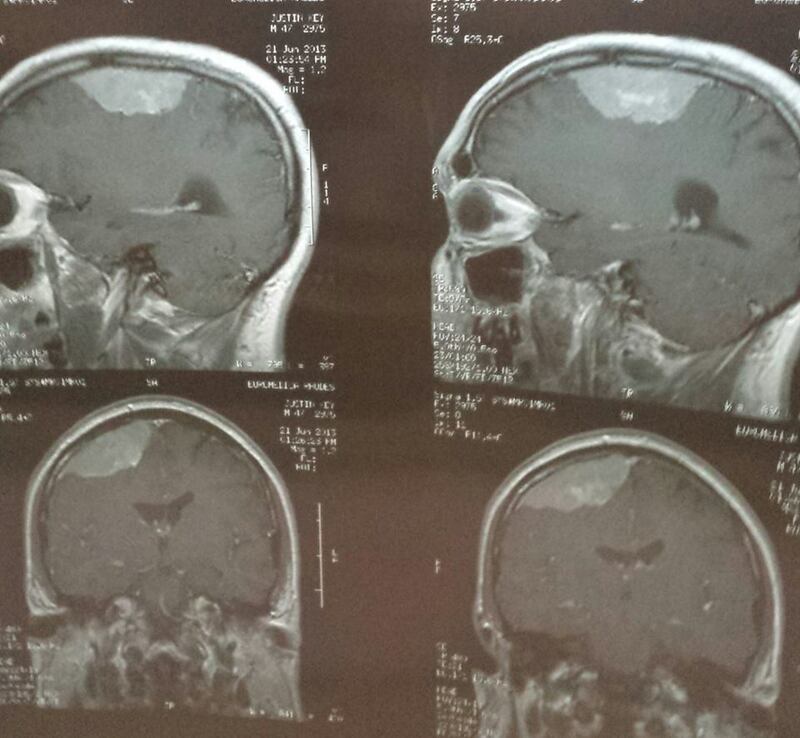 And here is a picture of his brain, that he put up on Facebook (Justin knows i'm writing about him btw). "that big pale splodge at the top...that's not supposed to be there"
The good news is that he's getting a flight back to England tonight,accompanied by a doctor that his insurance company have flown over from the UK. I'll be very pleased to see him.